This is a demonstration audition. Data is not saved. Auditions can be customized by adding your own logo/image (left), adding custom instructions that appear in this area (for example if you have deadlines, specific music that needs to be downloaded from your website, etc) as well as custom field values that you need to collect from the students. 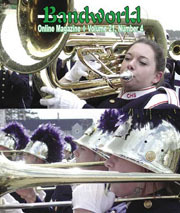 Note: If you already have a Bandworld online account, please Sign In at left. (You do NOT need to create a separate account for Audition Registration). Are you sure you want to withdraw your Audition Registration? This action can only be reversed by contacting Bandworld.org. Click on Confirm Cancellation to withdraw your Registration. Example data has been prefilled. Move through each step and change the data to see how the field validations operate. Data is not saved in demonstration mode, so feel free to enter anything. A new version of AME is available! The new AME has many upgrades and features not available in this original version. This old version will not be available forever, so we recommend you start using the new version.